Roses are red, violets are blue, tender is the night and super is this Valentine’s Day guide. To help you celebrate this day of love with your significant other, we’ve handpicked some exceptional dinners taking place on the 14th. If you still haven’t decided where to wine and dine, scroll through our city’s creme de la creme of Valentine’s dinners below. On its inviting and elegant semi-outdoor seating area, Alfresco presents diners with a delectable six-course set menu this Valentine’s Day to help make the most romantic night of the year one to remember. This lovely dinner starts with Fine de Claire oysters and Siberian caviar, as well as confit duck, before being followed by lobster soup with Rougié foie gras, as well as porcini mushroom risotto. For the menu’s main course, savor Sanchoku Wagyu beef tenderloin M6 with olive oil and poached langoustine with scampi ragout. Cap off a lovely dinner with a sweet rose lychee curd. Feb 14, 6-10pm; RMB1,388 for two, plus service charge and tax. Alfresco (Langham Place, Guangzhou). The Southern European cuisines of Spain, Italy and France involve one common ingredient: love. Aroma at the Conrad Guangzhou is home to these three cuisines. On this Valentine’s, the restaurant offers a lavish set menu, which includes two glasses of Veuve Cliquot Champagne, while ladies will be gifted a rose. Feb 14, 6-10.30pm; RMB1,314 plus 15 percent for two. Aroma (Conrad Guangzhou). At Michelin Plate restaurant Ebony, a seven-course dinner will be prepared by executive chef Jonathan Shea. A complimentary fresh rose and homemade chocolate will help to jazz up the romantic evening. For more information or to place your reservation, call 3808 8884. Feb 14, 6-10pm; RMB2,019 for two. Ebony (Mandarin Oriental, Guangzhou). An appetizing four-course dinner awaits at Gail’s: shrimp and mango in a tomato cup, grilled sirloin steak, grilled sole fish as well as strawberry shortcake. Secure your spot now by calling 3759 4226. Feb 14; RMB399 for two. Gail’s American Cuisine & Bar. One of the most renowned steak houses in town, G Restaurant will prepare a luscious dinner for you and your beloved on the most romantic occasion of the year. Enjoy delectable dishes from a tailor-made set menu in a stylish, contemporary setting with a panoramic view of the city. In addition to being treated to a special cocktail, you also get to create your own dessert! Call 8396 1234 ext. 3451/3452 to reserve your table. Feb 14, 6-10pm; RMB1,314 plus 15 percent for two. G Restaurant (Grand Hyatt Guangzhou). For RMB388 per couple, you and your special someone can enjoy a three-course meal plus two glasses of house wine at Hooley’s Irish Pub & Restaurant. For mains, the establishment will offer steak and grilled salmon with potatoes and vegetables. Additionally, snag a bottle of Australian wine for only RMB148. Feb 14, 5-9pm; RMB388 for two. Hooley’s Irish Pub & Restaurant. A six-course dinner coupled with a bottle of L’ Ostal Rose awaits at the high-end I by Inagiku in W Guangzhou. Japanese cuisine lovers are guaranteed a night of romance and delicacies. Reserve your spot by calling 6680 7830. Feb 14, RMB999 for two. I by Inagiku. 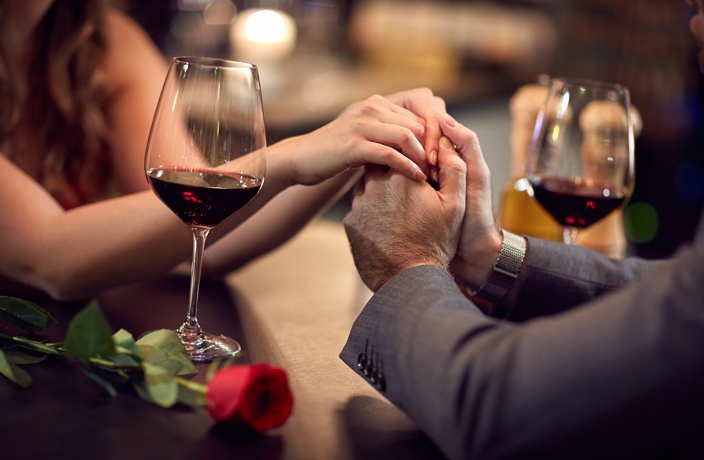 Spend a memorable evening with your special someone at Le Grill this Valentine’s Day. Enjoy a delightful six-course meal consisting of juicy steak, fresh seafood and an authentic French dessert while enjoying the restaurant’s romantic ambiance and a live violin performance. A lucky draw with exciting prizes, including vouchers for hotel stays, buffets and high tea, will help to spice up this special occasion. Feb 14, 6-10pm; RMB1,314. Le Grill (Sofitel Guangzhou Sunrich). Mango Tree’s menu features all the crowd-pleasers from Thailand with the perfect amount of spice. Owned by a gentleman who spent part of his youth in the ‘Land of Smiles,’ the space is sleek and stylish, with twinkling, starry ceiling lights and palm tree motifs at the entrance that add a sense of playfulness to K11. On this romantic occasion, the restaurateur at Mango Tree is going to treat patrons to two glasses of bubble wine by Chandon if they order certain dishes. Call 8883 5313 to make a reservation. Feb 14, 11am-2.30pm, 5.30-11pm. Mango Tree. There are several reasons you should dine at Mercato this Valentine’s: Michelin-quality food, stunning views of the city and a great collection of tipples, among others. On February 14, celebrate with your special someone at Mercato and indulge in praiseworthy dishes, such as Italian chicories salad with orange and fennel, aged balsamic and olive oil; raw shaved kingfish, fresh truffle and warm crostini; squid ink fusilli with seafood, chili and parsley; and porcini crusted salmon with warm leek vinaigrette and herbs. To book a table, call 6681 8086, and to view the full V-Day menu, click here. Feb 14, 5pm-midnight; RMB1,314 plus 10 percent for two. Mercato. Dining at Morgan’s this Valentine’s Day is simple but sweet. Their Valentine’s menu set includes two glasses of Cava wine, prawn cocktails, leek and potato soup as well as rose apple pie with cream and custard. For your main, choose between sirloin steak and Provencal salmon. Feb 14, 6pm-midnight; RMB388 for two. Morgan’s Public House. This quality Spanish eatery offers two menu sets for lovey-dovey couples to choose from. Both will include five courses, two desserts and two drinks, with salad, soup, spaghetti and mains calling you and your loved one’s names. Call 3831 0351 for more information. Feb 14; RMB698/798 for two. Mezomd Restaurant Espanol. This Valentine’s Day and Lantern Festival, Ming Court exclusively presents a set menu featuring innovative delicacies, including stewed baby lobster with pumpkin soup, pan-fried codfish with homemade salad sauce, shredded fish maw, mushrooms and chicken in superior soup, Wagyu beef with Thai basil and cashew nuts, braised 'e-fu' noodles with mushrooms and bean sprouts, poached homemade fish curd with seasonal vegetables, as well as chilled cream of sago with mango and pomelo. Make a reservation by calling 8916 3588. Feb 14&19, 11am-2.30pm, 5.30-10pm; various prices. Ming Court (Langham Place, Guangzhou). On February 14, the fine folks over at The Pizza Factory are offering a free wrist corsage for purchases over RMB188. Steal a slice of someone’s heart this Valentine’s Day at The Pizza Factory! Feb 14. The Pizza Factory. Portal boasts avant-garde fashion design, high ceilings and comfortable sofas. This Valentine’s, the chic lounge will serve up a themed afternoon tea with highlights including ‘lipstick’ Valrhona strawberry chocolates, Manjari chocolate curd passion cones, chocolate nibbles, passion fruit crisps, strawberry macaroons, strawberry ganaches and strawberry basil sauce. To place your reservation, call 8916 3388. Until Feb 19, 2.30-5pm; RMB268 for two. Portal (Langham Place, Guangzhou). There’s no such thing as too many parties. If we missed your Valentine’s get-together, post it to our events page. Your guide to the hottest, hippest events happening this month in Guangzhou! Here's how Guangzhou welcomes the arrival of 2019. We have your love affair ready to roar. Spreading veganism in the Middle Kingdom can be a slow journey, but grassroots advocacy groups across the country are working to change that. It's time to put 2017 to bed and get ready for another spin around the sun. Here's how Guangzhou welcomes the new year. The hotel has teamed up with renowned Austrian automobile manufacturer KTM to offer a superb, sports car theme afternoon tea. A bizarre hybrid of Hook’s ship and your standard high-end Japanese eatery, Diaoxi Haichan caught our eye the second we walked passed.